Color-coded sales and prospecting scripts. Home > Why scripts? > Why the Color-code. 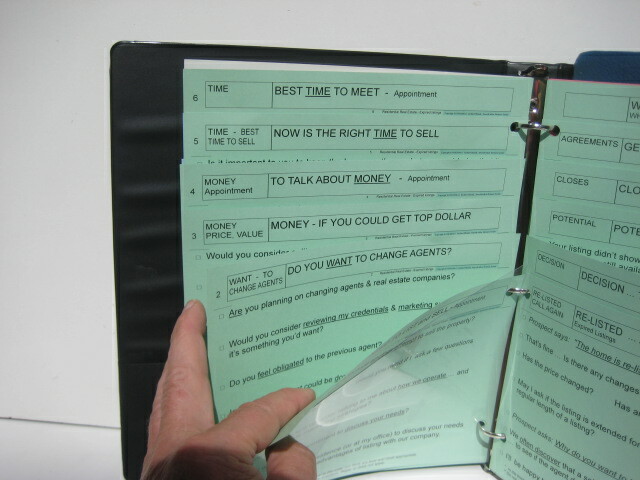 Color coded prospecting scripts makes it easy to find the dialogue when and if you need it. Smooth-talker uses the same colors as a "traffic signal" .. it's just about fool-proof! Color coded sales scripts for making prospecting calls are the most important feature of our sales scripts. It is the speed & accuracy which you can select a page with the dialogue you need. A key element was a way to identify each page of the script with a color-code so a salesperson can easily and quickly locate an important line of dialogue the instant they need it. Asking sales questions .. printed on green pages. It means it's your turn to talk. 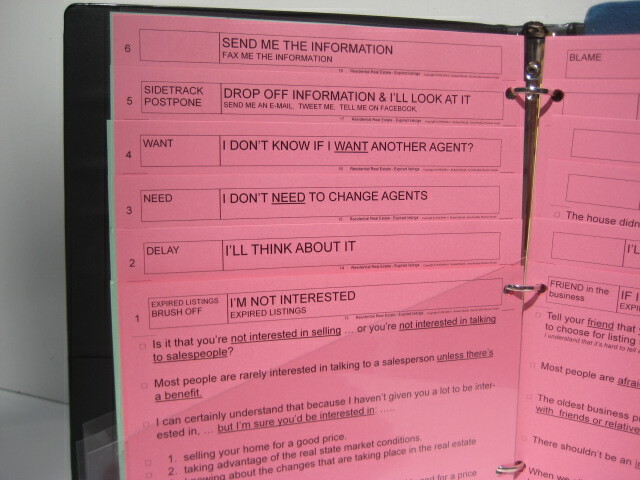 Responding to objections .. printed on red pages. Let the other prospect ask a question or state an objection. Selling & Telling ......... printed on yellow pages. Means proceed with caution whenever you are selling something. Scripts that are color coded is a proven way to have an organized system that's at your fingertips. Smooth-talker Sales & Prospecting Scripts are designed to incorporate a fast & easy way to navigate the scripts and to add some semblance of order to the basic components of communication. The color-code we developed was the most element for locating an appropriate line of dialogue. Each page of the prospecting scripts contain up to six 1-liners and approaches that can be simply read aloud to a prospect. GREEN The pages for the lead-off & sales-openers represents the color-coded scripts that were meant for salespeople to "talk" to ask questions, get an appointment, talk about money, see if there is potential, ask for a decision, close for an appointment, etc. They are single purpose, stand alone scripts. The dialogue identifies you, gives a reason for the call, and states a brief selling message. and let the prospect ask a question, state an objection, and voice their opinion. known as the “language of selling.” It is the typical sales information and you should have at your fingertips. It is designed to be general selling statements with blank lines for customization and additions. "Colored card-stock can be identified from any angle, front or back and no additional tabs or markings are needed." Usable in the real world. 16 pt. font (type face) makes the script dialogue easy to read. 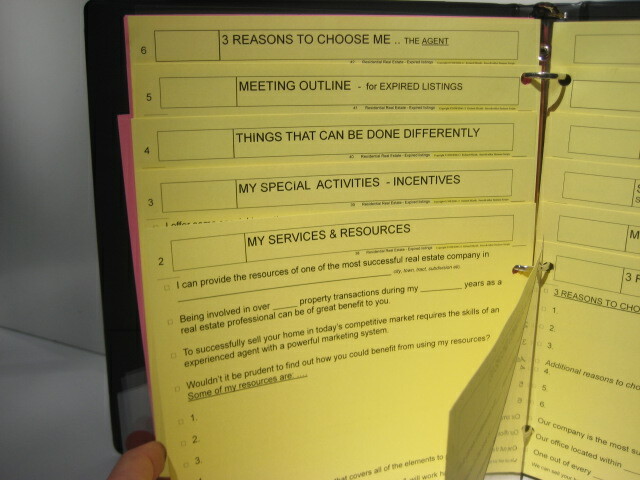 Smooth-talker color coded sales scripts has prospecting dialogue that is usable in the real world of business development. The color coded sales scripts are printed on heavy card-stock to withstand the constant flipping of them during a propecting call. 4 clear plastic section-flippers are provided to navigate the scripts. The clear plastic flippers are appropriately marked in green red or yellow color with a visible tab that's easy to find. The plastic section-flipper opens a section of 12 page headings (6 per side) which can be viewed at a glance. The need for prospecting scripts is greater than the need for selling scripts. Selling scripts are easy to come by. Any good training program could teach you the fundamentals of a sales call. The reason it is easier to find a selling script rather than a prospecting script is because they focused on a tangible product instead of "human nature." "We discovered that salespeople weren't prepared for all of the things that could happen when making a prospecting call." No clear-cut method or formula existed. There weren't any scripts available in like the ones I needed. Even though everyone had the same problem, no one had come up with such a mechanism for organizing the components. There was enormous need for a system and formula that efficiently organizes the main elements of prospecting and selling dialogue. There are no known products comparable to Smooth-talker Sales & Prospecting Scripts. All business's have the same problem. Namely ... not enough prospecting is being done and the salesforce generally doesn’t suffer from an abundance of new prospects. Big companies, small companies, professionals, and business development people universally agree that to be successful requires prospecting. It becomes a prospecting problem first and a selling problem second. Analoqies to Smooth-talker Sales & Prospecting Scripts. There are many analogies and descriptions of Smooth-talker business scripts and prospecting scripts. The descriptions are: cheat-sheet, crutch, and communications tool. Other analogies are: backbone, assistant, right-hand, come-backs, and talking-points. They all are correct. How I came to use the traffic light to organize the sales scripts. I was sitting at a traffic light when I had the brain-storm for a color-code for the prospecting scripts. The "traffic light" changed and I automatically reacted to it. The idea hit me that I needed colors that resulted in a reaction for navigating the prospecting scripts. I reacted without thinking. I hit upon a solution to an age-old problem of how to organize a prospecting script." Always have an answer. Never ask a prospect a question that you don't have an answer to. It's the technique that journalists live by. They rarely ask questions that they don't have some inkling as to the answer. Answer a question the way you "wish" it were asked. Answer it the way you "wish" a question were asked and then choose a self-serving answer. Four out of five times a question can be anticipated and an answer can be scripted. Isolate, clarify, and then restate it your own way. Restating the objection from a different point of view is better then just echoing back the prospects last words. Restating it your way leaves out the irrevelent things that a prospect will say. How to answer unspecific or over-generalized questions or objections. A general question or objection deserves a general answer. If the prospect talks in generalities they don't really have any reasons not to agree with you. The "it depends" response is overused & is annoying. The universal way to answer questions or an objection is to say “It depends.” You should use this method sparingly. If you use “it depends” with every question asked, the prospect gets irritated trying to come up with answers to clarify what it “depends on.” We all know that the person who asks the questions controls the conversation. The point is that the business prospect feels that they don’t have control. Never belittle a question or an objection! It goes without saying that a question or objection should “never” go unanswered during a sales call. They may be minimized and the subject changed, but at least they should be acknowledged. Even if you restate the question or objection in your own words, however briefly, a simple response is called for. Identifying whether it is a question or an objection. It's very close call when determining whether a prospect responds with a question that contains no real disagreement, or, is an objection to the topic at hand. Don't forget you are catching them off guard with your questions about your interests, your agenda, and what you want.